Don't miss out on the fun and games! Be sure to check out our second annual Pony Homecoming Carnival on Friday, Sept. 28 from 4-6:30 p.m. at the high school. This family-friendly event features inflatables, carnival games, activities, food trucks and more. If you would like to volunteer to help supervise an inflatable or youth carnival game sign up online. 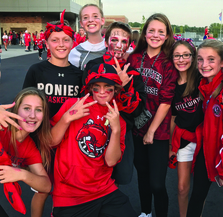 Everyone in our community is encouraged to wear red and black or your favorite Pony gear on Friday. Take a photo of your friends, family, neighbors or colleagues dressed up in their pony wear and post it on social media with the hashtag #PonyPride. School board members will continue to engage in important conversations Thursday night related to the district’s future facility needs, and our current and future financial reality. Learn more. While no action is expected at the Sept. 27 school board meeting, the board is expected to have a discussion around a list of possible budget reduction options to address the current $2.5 million general fund budget deficit. The administration is NOT recommending any of these items at this time, but is providing a list of areas that could be considered as the board looks to find ways to address the budget shortfall. Based on feedback and direction from the board, administration will create a budget reduction list to share with the community in the coming months - with board action expected in December. We encourage you to stay informed and engaged in this conversation. The public can attend the meeting, which will begin at 6 p.m. at Stillwater City Hall or you can watch it online. The Pony Express has been recognized as one of the top high school newspapers in the country. 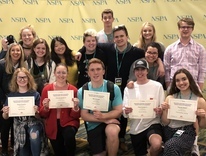 Stillwater student journalists earned the 2018 George H. Gallup award from Quill and Scroll News Media Evaluation service. Stillwater is one of only 10 schools from across the country and the only school in the state of Minnesota to receive this high honor. Read more. Four Stillwater Area High School seniors were named semifinalists in the National Merit Scholarship Program. Abigail Banks-Hehenberger, John Maloney, Elias Roll and Keenan Walker are among just 16,000 seniors in the nation to earn the recognition. Each year about 1.6 million students apply, but only one percent are accepted as National Merit Semifinalists. The four Stillwater students will now compete for 7,500 scholarships worth more than $31 million. Read more. 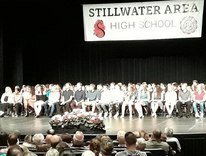 Congratulations to our Stillwater Area High School students who earned academic letters for their school work! Letters were given out during a ceremony on Monday to 541 students who earned a 3.75 grade point average and above during the 2017-2018 school year. 111 of those students earned a perfect unweighted 4.0. 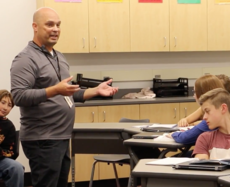 Stillwater Area High School teacher Darrell Salmi has been named 2018 Secondary Teacher of the Year by the Minnesota Society of Health and Physical Educators (MNSHAPE). The award recognizes his outstanding services and contributions in secondary school education. Salmi has taught physical education and health in the Stillwater Area Public School district for 22 years. He also serves as a football and strength and conditioning coach. Salmi has been an active leader in helping to advance physical education opportunities for all district students. He’s even presented on health and physical education at the local, regional and national level. 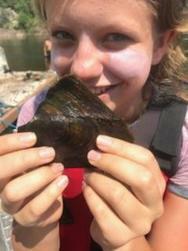 Stillwater Middle School science teacher Bretta Chaplinski and several of her students recently worked with the Minnesota Department of Natural Resource (DNR) searching for the federally endangered Winged Mapleleaf mussels in the St. Croix River. The DNR is collecting the Winged Mapleleaf mussels to propagate and ultimately restore them. Chaplinski’s group was collecting mussel shells for a display case in the middle school which was funded by a $3,000 grant from the Partnership Plan. Students will polish the shells off and bring them for positive identification to the Center for Aquatic Mollusks Programs in Lake City, Minnesota. More photos.